The perfect weekend for a perfectly celebrated birthday. Not just one but two birthdays were celebrated, actually. 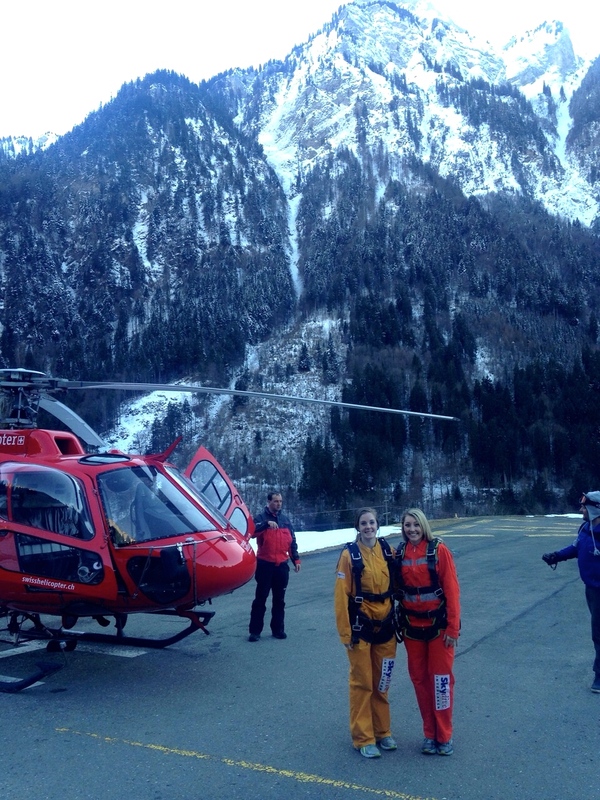 It so happens that my friend Allie and I were born just two days apart, and as newly minted Madrileñas sipping on beers, supporting our Seahawks from a sports bar in the heart of Madrid last fall, we decided we both had dreams of skiing the Swiss Alps. 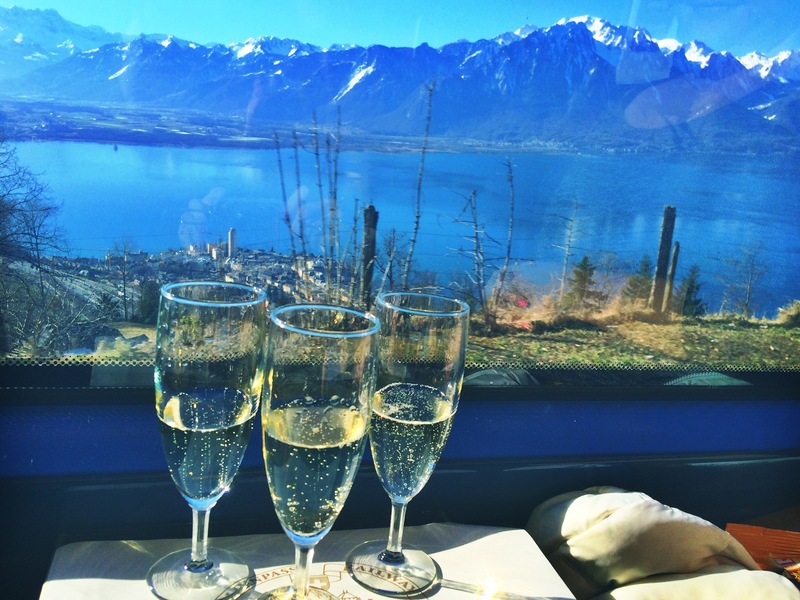 Champagne on the Golden Pass Railway from Lausanne to Interlaken. March it was decided, would be the time to do so. 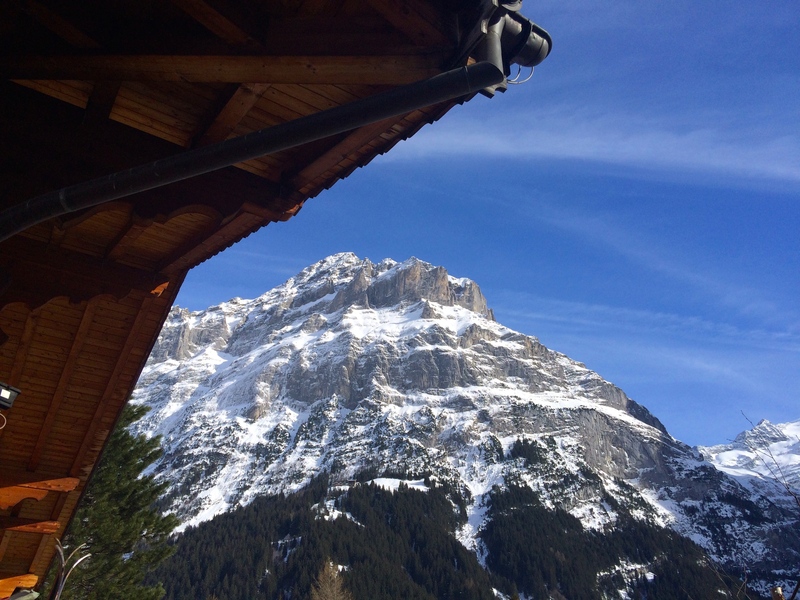 As March approached we began to realize organizing a ski-trip to the Swiss Alps was a bit more difficult and (ahem) pricier than our TESOL teacher budgets allowed for. 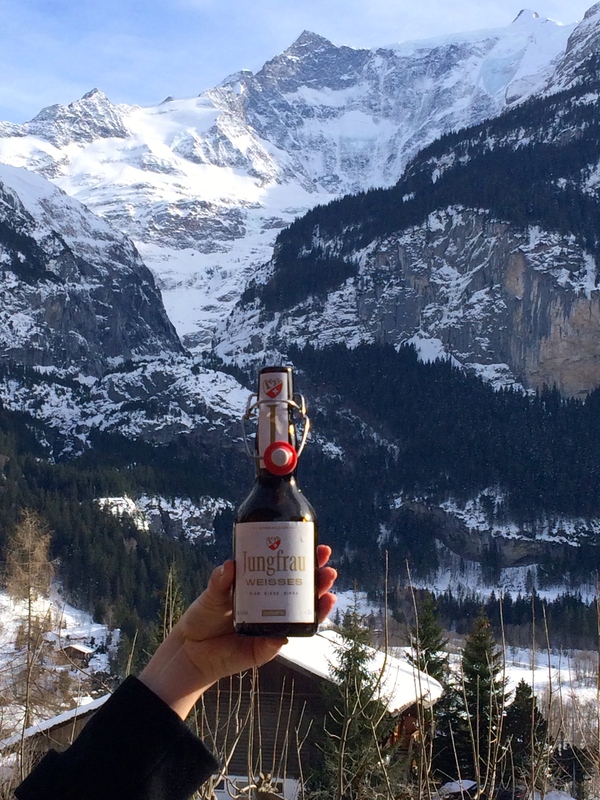 Zermatt was no longer an option, but we were quickly satisfied with an equally beautiful destination mentioned by our friend Erin: Interlaken. Taken from a moving train and it still looks that beautiful. 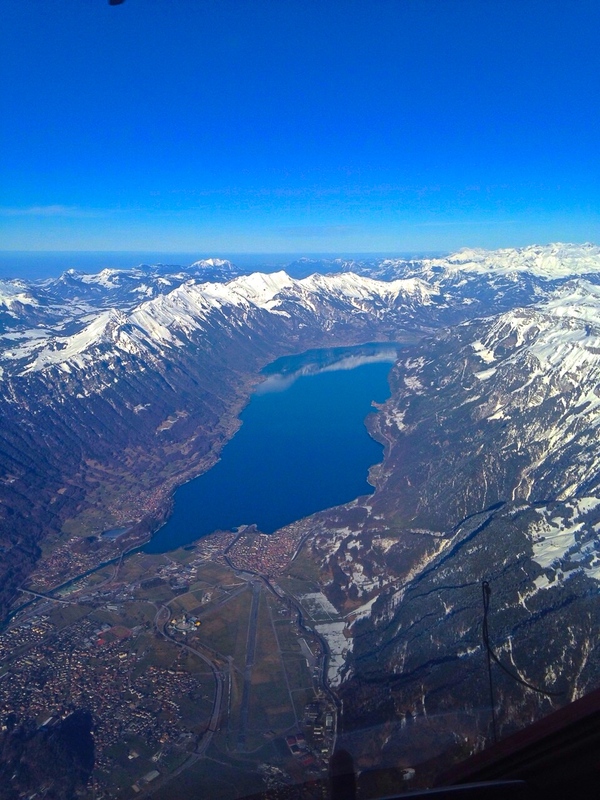 We couldn’t have asked for better weekend weather, the skies were clear and as blue as could be, matching the beautiful hues of each lake we passed. 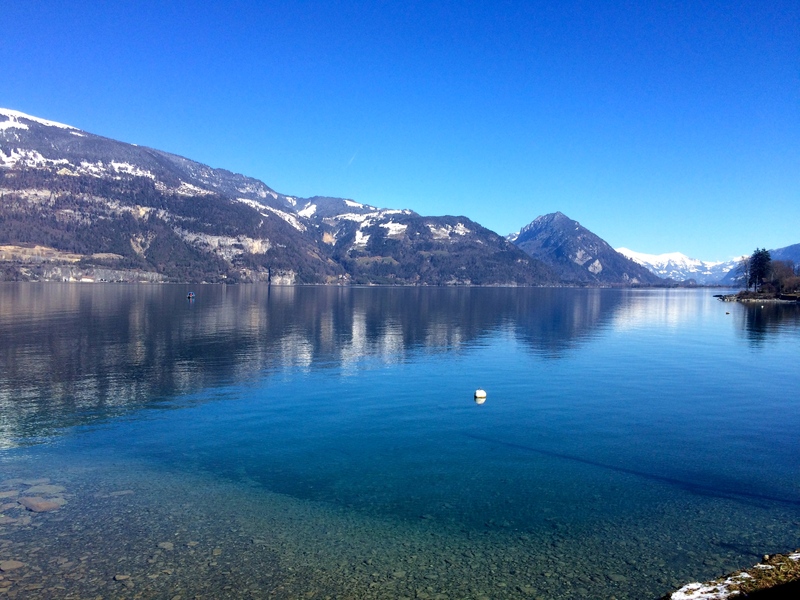 From Geneva we took a train to Lausanne and continued on the Golden Pass Railway via Montreux, Zwiesimmen, and Spiez to crossover and through some of Switzerland’s most beautiful terrain. 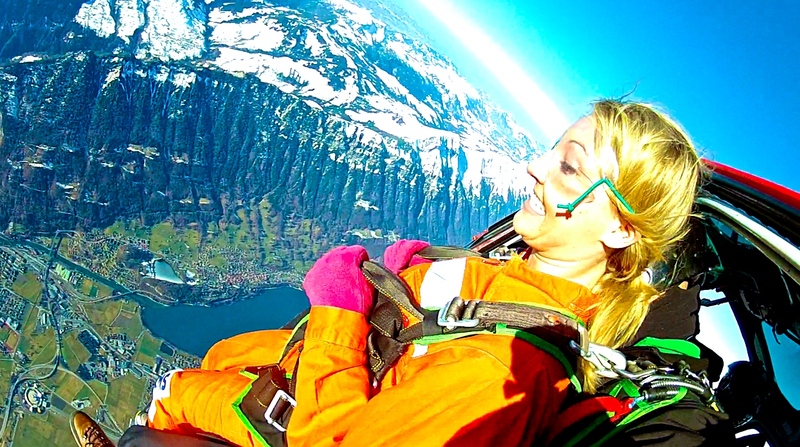 When we arrived in Interlaken we had just enough time to grab some lunch before making our way to what we had really come for, SKYDIVING. 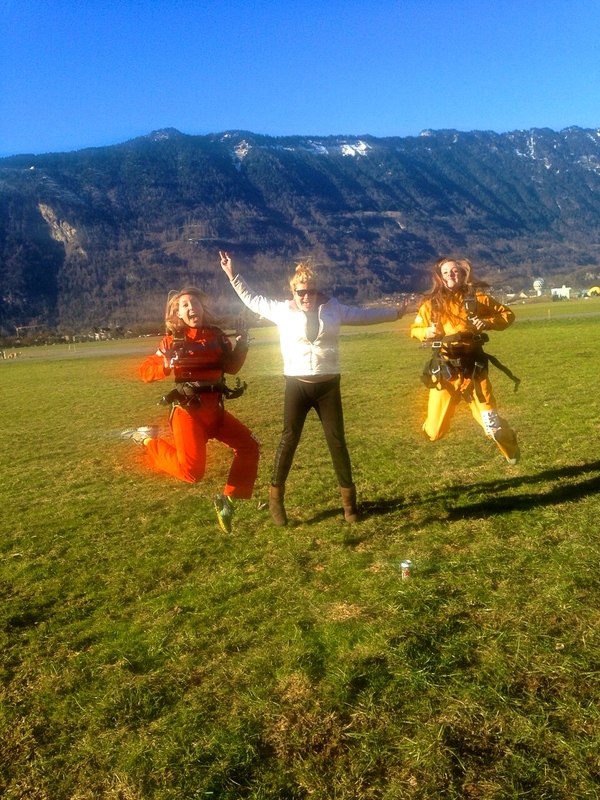 I figured if I wasn’t going to be skiing the Swiss Alps on my birthday I might as well jump over them. 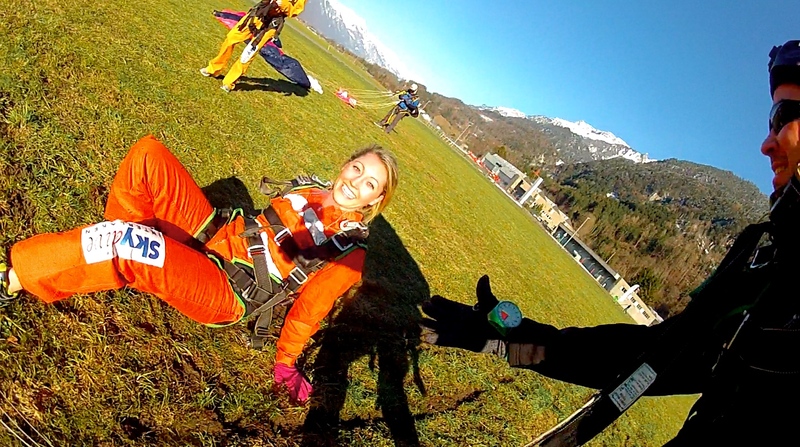 Getting ready to head up and over the lakes and mountains prior to jumping with the Skydive Interlaken team. The experience was something magical. 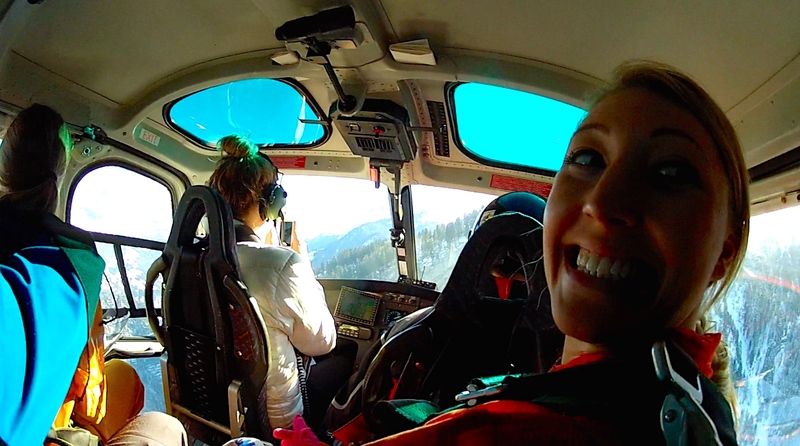 I became nervous for 2-3 seconds when I had to make the first step out of the helicopter and onto the ledge. 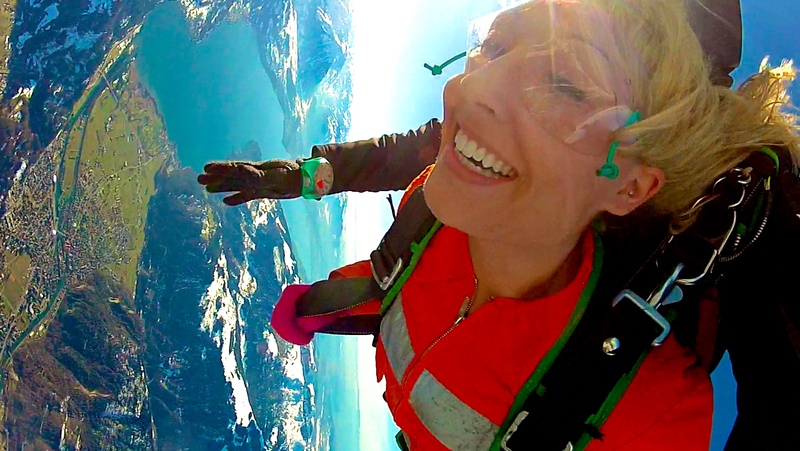 I was so amazed by the beauty below me, however, that I hardly noticed the nerves or adrenaline racing through my veins, and before I knew it we were tumbling through the air. HERE WE GO! The moment I got nervous for 2.5 seconds. View from above. Truly breathtaking. 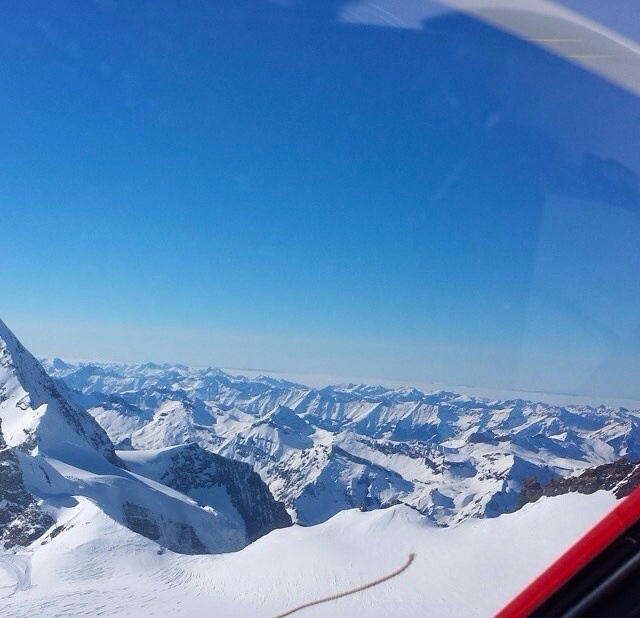 The is the scenery we jumped over. Yes. We tossed and turned for a while before leveling out and then proceeded to free-fall for 30-45 seconds. The air was cold, the sun was bright, and the lakes and mountain peeks shone. It was jaw-dropping. It was peaceful soaring above the land and taking in its sites. It reminded me of the feeling I got when scuba-diving in Thailand last year. There are these moments of quietness that allow the beauty around you to seep into your pores and make you appreciate the power of nature. We all landed safe and sound! Landing is surprisingly easy! And then we shot-gunned Heinekens. 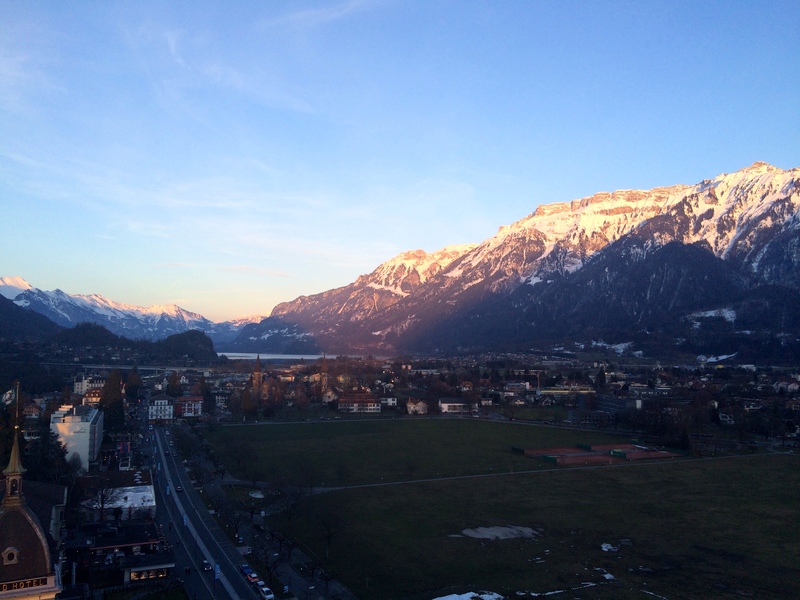 Later that evening we made our way to the top of the tallest building we had spotted in Interlaken to capture a few sunset shots before dinner. While still undeniably beautiful, it’s hard to compete with the views we seen earlier in the afternoon. We dined on cheese-filled dishes and were treated to a bottle, yes bottle, of local unlabeled schnapps by the wait staff and a piece of chocolate cake, candle included. 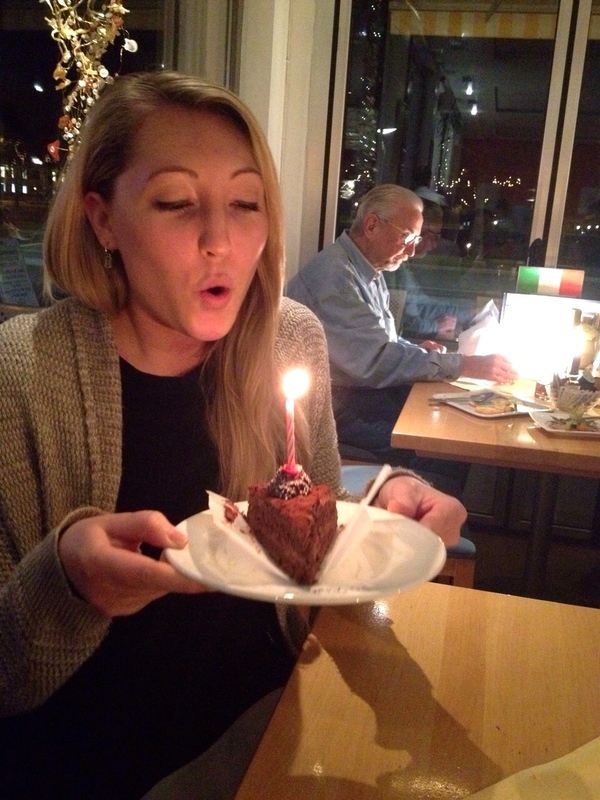 It was a lovely way to end an eventful, yet, ‘simple’ and enjoyable birthday. 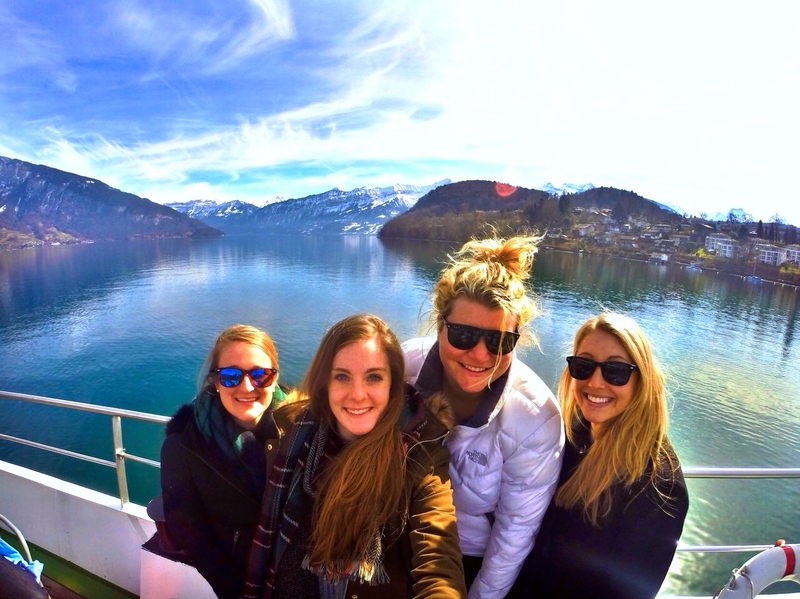 On Saturday, Grace joined us in Switzerland and the four of us made a day out of exploring the surrounding villages. 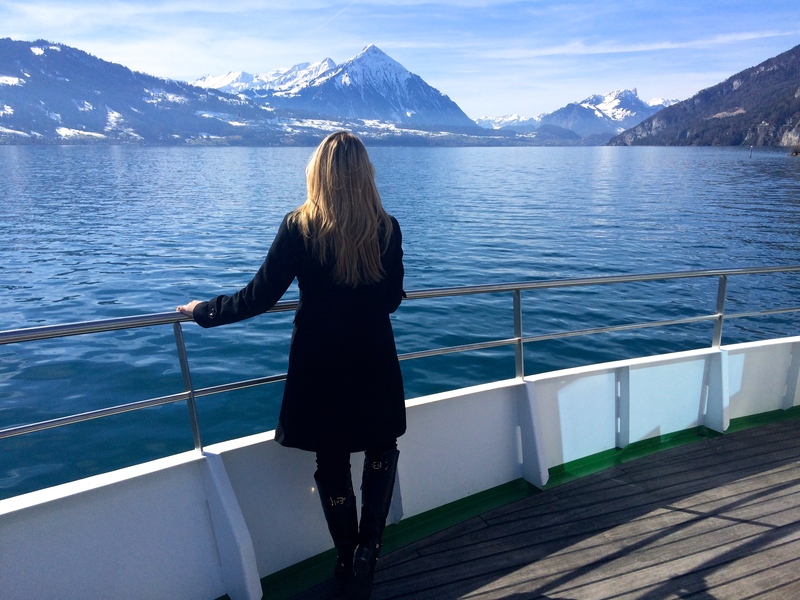 We took a two hour cruise on Lake Thun, followed by another beautiful train excursion up to Grindelwald. We had hopes of zip-lining in the quaint and utterly charming ski-town, but we arrived rather late in the afternoon and apparently the weather wasn’t great on the mountain (although it looked perfect from where we were standing), so instead we enjoyed some local brews and took in the scenery. It’s hard to not have a “straight out of a magazine” experience when you’re surrounded by such dominating beauty. 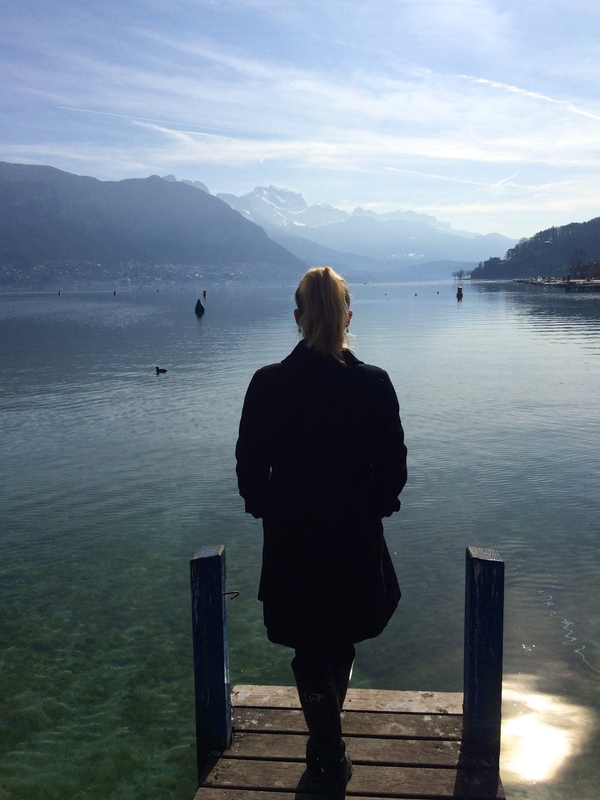 I have always loved Switzerland and each time I return my fondness only grows deeper. 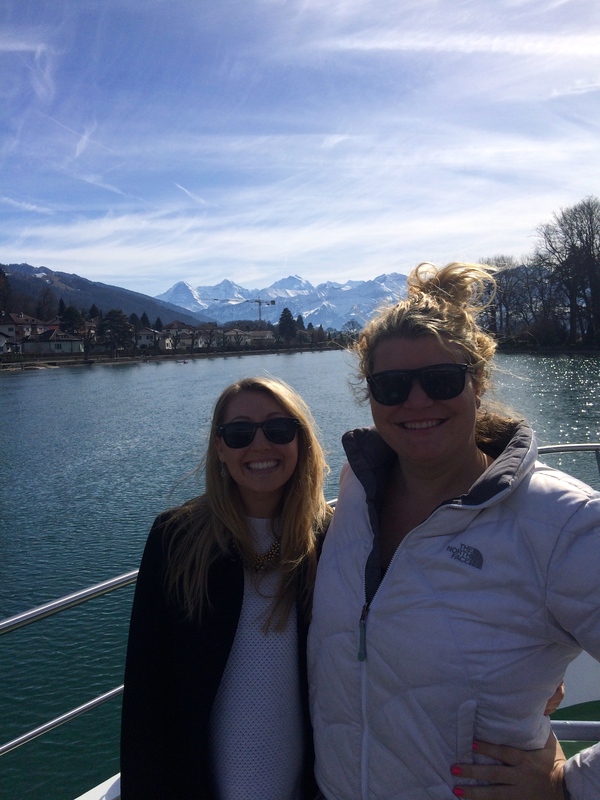 Sunday, Erin and Grace flew back to Madrid from Geneva and Allie and I made our way to Annecy, France for a night. 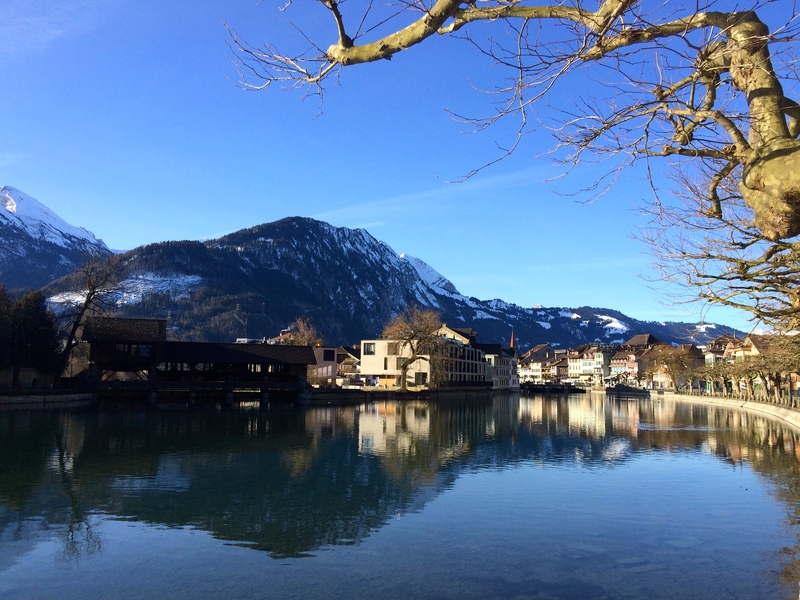 We had explored much of what Interlaken had to offer, though you could spend hundreds of more euros experiencing the countless extreme sports available, and so we decided to make an unplanned stop. 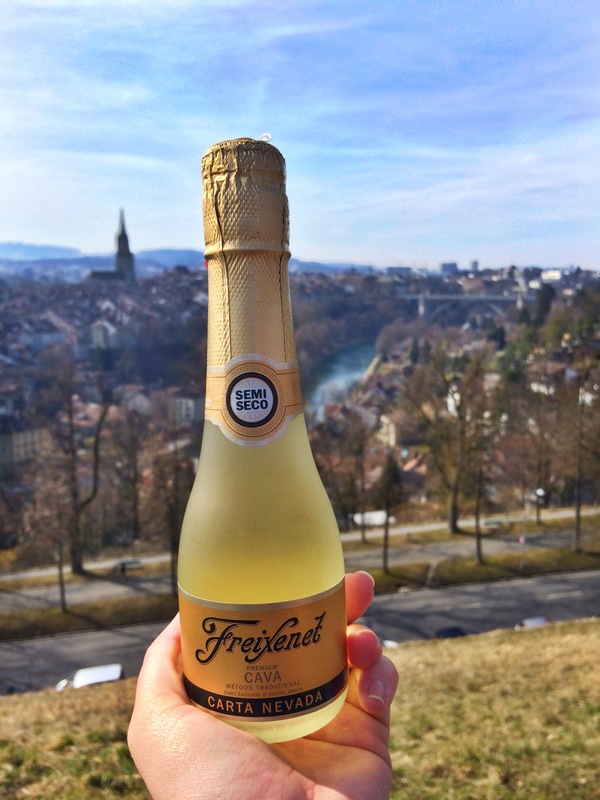 We got off the train in Bern Sunday morning and explored the country’s capital for a few hours. It was another perfect day and with a little research the night before we discovered there were free bikes for rent right outside of the train station. Score! Exploring Bern by bike ended up being quick and easy and got us to some lovely sites in just a few slow hours. The first thing we did was ride five kilometers outside of the city to Zehendermätteli. It’s a great little working farm that sits on the edge of the river. You have to hike down to it as the hills become too steep for city bikes, but it’s still easily accessible to people of all ages! What an amazing concept, a farm almost right in the heart of the city. A perfect hidden gem. After some early morning brews and cake for Allie’s birthday we cycled back into town for the famous Rose Garden views. 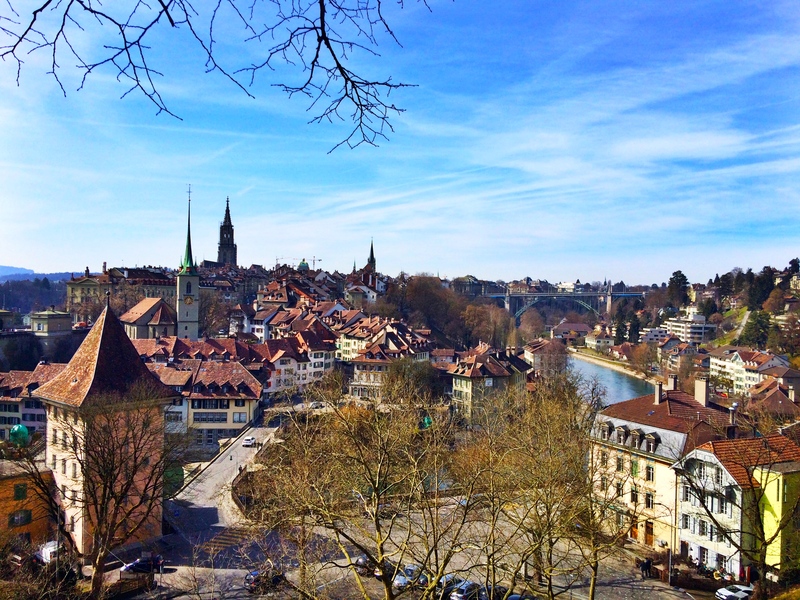 If I lived in Bern, I would sit up here everyday. Of course we had to pop (mini) bottles for Allie’s birthday, which she proceeded to accidentally spray everywhere and understandably irk the Swiss passer-byes. But, it was her birthday, so all is forgiven, right? We leisurely made our way back to the train station in the early afternoon and hopped on the 2pm train to Geneva. We used our free, 5 Franc vouchers, the inspector on our earlier train had gifted us in acknowledgement of our birthday weekend and purchased some chocolates for the two hour journey. It was a quick good-bye to Erin and Grace before walking to the nearby bus station to purchase tickets for Annecy. 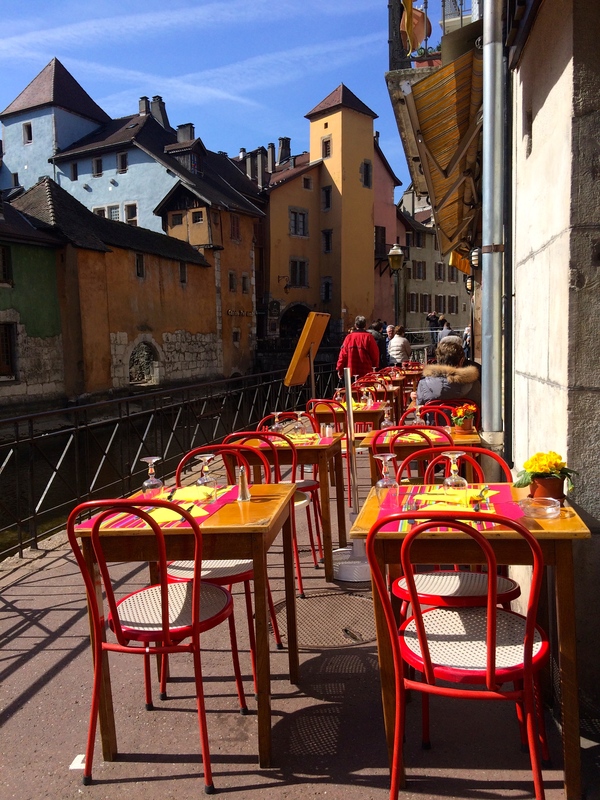 If you are ever in Geneva plan for a day trip (or longer!) 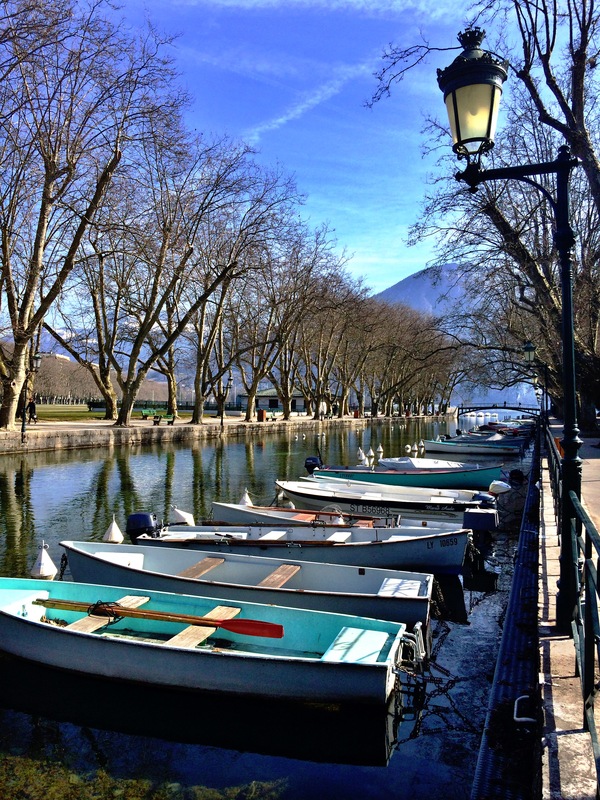 to Annecy as it’s definitely worth seeing. 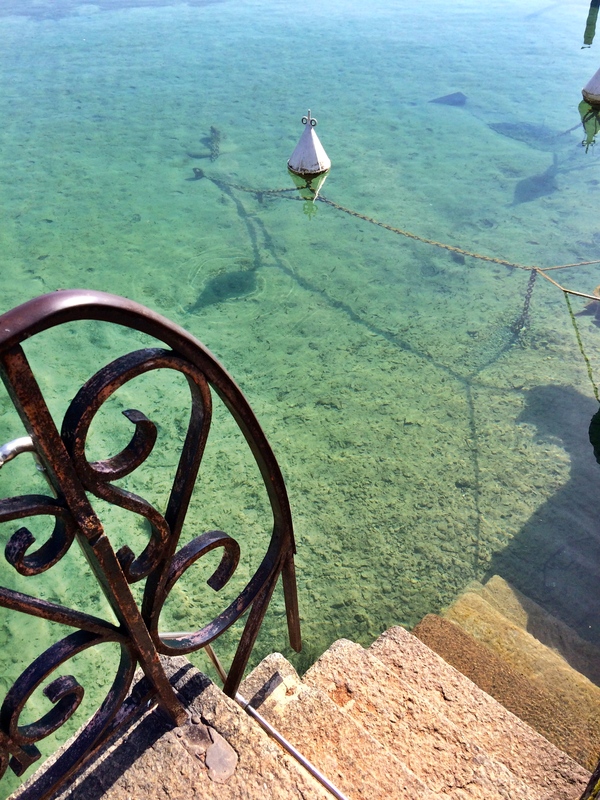 Blessed with more beautiful weather we walked around the lake and sat in the park, ate croissants and window-shopped. It was a well spent Monday away from school. Two of our best meals were here! 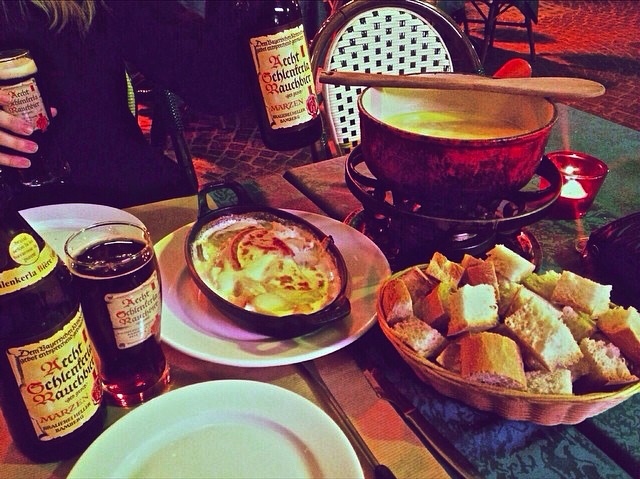 The first was dinner of fondue and tartiflette washed down with a mouth-watering smoky beer. Dying. It pretty much consisted of only beer and cheese, (really, we didn’t touch the salad that accompanied them) which are my two favorite food groups so you can imagine how euphoric I was. The second, a lunch at Le Chalet, was escargot in creamy white wine sauce and a local sausage served with risotto. It was so simple and amazing we forgot to take a picture prior to devouring it in all of its beauty. As the afternoon lulled on we took the bus back to Geneva straight to the airport for our return flight home. 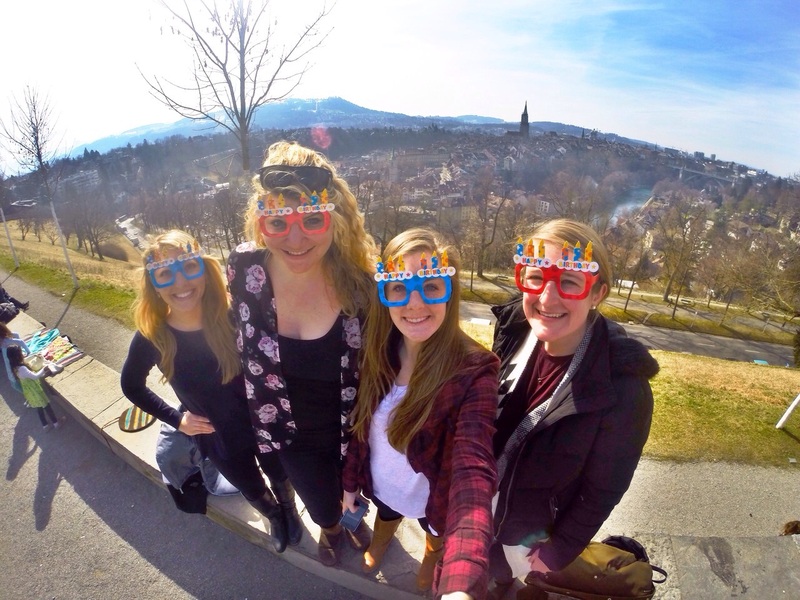 Work would find us early Tuesday morning but it was ok because the four amazing days we had received in central Europe were just the thing to revitalize the soul – and spend a birthday. As another one has come and passed for me I have to gush a little about how thankful I am for the people in my life, the things I’ve accomplished and seen, and my dreams and goals that continue to evolve and I continue to chase. Twenty-five was truly a wonderful year spent reflecting on who it is that I am and accepting that person fully. I’ve discovered so many things new and old and will continue to thrive on the power of curiosity. I’m a firm believer in keeping momentum moving forward, even if you don’t truly know what’s at the end, keep going, keep being curious. For me, twenty-six will be no exception to these virtues. Thanks for taking us along on another trip.